Question: Why do we need to hope for redemption, which is impossible without our hope? Answer: It is simply necessary to feel how much we need it. As long as we don’t have a deficiency for something, there is no Kli; we are not ready to receive the desired fulfillment. The Creator is ready to give us gifts as much as we want. He demands only one thing: that we will have a desire for them, otherwise we don’t feel the gifts. If you bring a gift to a person that he doesn’t need, he will not feel any value in it. So we must attain a deficiency and then we discover that the gift is already found, it’s near us, in the air. The entire space around us is filled with gifts; you simply don’t see and don’t imagine what is happening here. Everything is already found, you only need a deficiency. It’s like I take off my glasses and don’t see anything in front of me. How is it possible to give some kind of gift to a person in conditions like these? The Upper Light is at absolute rest, but the gift is revealed in a desire that is appropriate for the Light. Prepare your desire and the gift will be revealed. There is no need to ask the Creator: “Give me, give me!” The moment, I begin to prepare my deficiency, I discover that I am not ready to do this, and then I will ask the Creator: “Help me mold my desire for the gift that you have prepared for me.” And the Creator will help. But as long as I have not formed the desire, I will not feel the gift. The desire must precisely match the gift, the Light. The redemption will not come as long as I don’t have a complete desire, a need for the Creator, the king of the world, there is no feeling of exile. Separation from the Creator is death for me! He must be discovered in my world; otherwise, I will not be able to get what I need so much. If I don’t have this feeling of exile, then how can the redemption come? How can the gift be revealed if I don’t have a need for it? I must feel that I am yearning to bestow and am not ready to reach this, so I am obligated to have the Creator save me, reveal His greatness. I don’t need His revelation, otherwise I would begin to enjoy him egoistically; rather, I need the feeling of His greatness. This is all that I ask! Just as it’s important for me to go on vacation or relax on the beach now, I must constantly think about bestowal and understand that in order to attain it I need the greatness of the Creator. My desire needs to receive a form that is accommodated to the revelation of the Creator. I want to bestow to the Creator, to feel within my desire how I bestow to Him, and that He has enjoyment from me and bestows to me through this manner. In this way we are together with Him in this intention, in adherence with one another, in mutual bestowal. It makes no difference who bestows and who receives. The Creator gives and I give; He bestows and I bestow, both of us are equal. It’s not important who is first and who is last if there is love between us, our actions are completely equal. That He is the Creator and I am the creature loses all meaning. Is the infant less important to his mother than she is important to herself? Question: Does it follow that the Creator also receives? Answer: The Creator gets pleasure from me. But where does He enjoy if He has no desire to receive? He enjoys my desires! It’s like a mother who enjoys her baby because things are going well for him. Her pleasure is found within the infant. Now we can understand how great our desire for pleasure is. Within it there is already the desire to bestow of the Upper, and so everything begins and ends with our desire. Question: Where am I found in the connection between us into one point of mutual guarantee? I do not find myself there! Where are my characteristics and tastes? Do they disappear within this connection? Answer: Specifically when you disappear, you are found. You exist only in this form when you melt into the connection. Does a mother have anything of her own other than what she provides for her children? Does she need something of her own? No, that is why she is called a mother, thinking only about the welfare of her children. Bina has nothing of her own. Her upper half belongs to the Sefirot of Keter and Hochma, and her lower half belongs to ZON, and what is left for herself? She only has the point of the Chazeh where Bina calculates how much to rise further and how much to descend further. The further a person rises up the ladder of levels, the more he will resemble Bina and extend further over all of reality. His entire upper part reaches to the world of Infinity, and his entire lower part encompasses all the lower levels, down to the lowest part. In that way, he covers the entire creation. Question: Is a Tzimtzum our first activity without which it is impossible to go out into the spiritual world? Answer: A Tzimtzum (restriction) is the first condition that differentiates this world from the upper world and differentiates an intention in order to receive and an intention in order to bestow. In this way I go out from a perception of the physical reality I am now, like all of humanity, and break through the Machsom (barrier) that is placed before me in order to begin to feel and live on its other side. 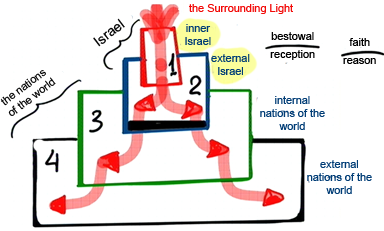 The Tzimtzum determines on which side of the border of the spiritual world I am found. A Machsom is a potential obstacle, a potential level, above which it’s necessary to leap in order to enter into the new dimension, the new world. And it’s possible to do this through a Tzimtzum of desires. A Tzimtzum requires gradual preparation and a great effort with a great need to move towards the perception of a new life, where I only want to be directed from myself outward, beyond my nature. Throughout our history we have advanced thanks to the development of the ego. This is what makes us different from animals, plants, and inanimate matter in which the desire to enjoy hardly develops. A person must be given the freedom to choose, or at least to be taught, that this freedom exists so that the ego will grow and he will come closer to it. The greater efforts he makes in preparing and correcting it, the greater the evil he discovers. Therefore, when a person studies and makes efforts in the group, participating in its work, trying to lower his head as is required of him, he establishes different kinds of support. This is called seven years of satiety. Then the seven years of famine are revealed, since he has prepared his vessels and now he can cope with the unpleasant revelations in his desire to enjoy. This happens so that he will be able to work with his desire and discover that his egoistic nature is his enemy. Therefore, Moses complains to the Creator that when he begins to speak to Him and reaches the desire to enjoy with his spiritual mind and heart, with the wisdom of Kabbalah, this desire becomes even worse. Before he thought about his correction, there weren’t so many ascents and descents. There were only slight movements as a result of being incorporated in the group, but later he began to understand that it was possible to get closer to the Creator by connecting and establishing a nation. The closer a person gets to the right line, to the Creator, to the value of bestowal, to the awareness that the upper force is the most sublime attribute and there is nothing but that, the more strongly the left line and Pharaoh awaken in him. This happens so that a person will remain balanced, will be able to stabilize his state in the middle between these two lines, and will find out who and what he is. Therefore, Moses rightly complains that the people feel worse since he came to the Creator. The reason is that the moment Moses comes closer to the Creator, Pharaoh grows in order to keep the balance between the Creator and Pharaoh. We must not forget that. Moses comes to Pharaoh to speak on behalf of the Creator, which means that he understands that his goal is to get closer to the Creator. As a result, everything becomes worse, and only the balance between these two forces can help out here. This means that the two poles have to be connected and we should realize that they both come from the Creator, that there is none else besides Him, and that we have to follow both, which means the middle line. We must not forget that the two lines have to be incorporated in the middle line until a third partner comes, connects, and completes them. This means that there is a constant war. Question: Through its activity, can our group help the world prevent a new holocaust now? Answer: Definitely! I am constantly speaking about this; it is for this that we exist. If Israel decides that the interior is more important for them than the exterior, everything is in our hands. I mean that the interior, bestowal, must be the higher value, more dear than reception, in other words, faith above reason. If we arrange Israel this form (1-2), nothing more is needed. All the rest will take care of itself. It’s not necessary to look at the world, as it will be a copy of what happens with us. Yet today, neither our group nor the exterior of Israel, meaning the people of Israel, are suitably connected. And it’s also necessary to take into account that the exterior of Israel still has a part called the “mixed multitude.” All of these parts must be arranged correctly, from above to below. Israel is to blame for this, and only they can correct everything. The problem is that when we remember what happened, it’s up to us to draw the right conclusions and begin to act so that this will never come back. But we are not doing it. So the Memorial Day for the holocaust comes and life goes on as before. And that we are going and advancing towards that same state doesn’t bother anyone. People don’t understand the connection between this state and that one. Israel is fighting for its image all the time. But why relate to this if through our inner state we determine everything that happens outside. Billions are being poured into creating a good name for ourselves in the world. But this won’t ever happen. If we do what is necessary to unite, the whole world will feel this inside, will accept this knowledge together with the Light, and will understand that something good happened. And people will understand that this is coming through us. They will lift us upon their shoulders, as the prophets wrote, in order to bring us to the sacred Kli of the collective soul. The world is ready for it. The problem is that before us are the people of Israel, a “stiff-necked people”, as it is called in the Torah. But we must carry out our work on that condition. A day like this is the most appropriate time to talk about this to all of the people. Everything depends upon Israel. This people endured many troubles throughout all the generations. But if a person goes deeply into the wisdom of Kabbalah and sees the plan of creation, he cannot blame the higher supervision for anything. He will be convinced that it’s always good and beneficent. It’s impossible to do anything against this because everything is done with a single goal, to bring us to wholeness. If we have a child, we can pamper him with everything and comply with all of his desires. But everyone knows that he will grow up to be a worthless man. So there is no choice, we must take him together with all of his egoistic nature, with strong hands, and educate him, and then he will grow up to be good person. Question: What should a person’s inner work be during meals? I only need to bring myself to the point of connection, of adhesion, and then to constantly expand it by feeling many attributes, feelings, sounds, and Lights in it, which means to discover it. The more I clarify the point of adhesion, where the Creator is, the deeper I delve into it and the sooner I will begin to feel its attributes and the combination between them, and thus will summon the influence of the upper Light upon myself. Then I will discover a special passage to the upper world. This is what we have to engage in and not only during the meal. Gradually the point of adhesion will begin to expand, and from this central point of creation, it will first become the world of Assiya, and then the world of Yetzira, Beria, etc. I will begin to unite the individual souls inside me into one general soul on the levels of the still, vegetative, animate, and speaking. This will gradually be revealed in life, a complete connection between feelings and understandings, and is continuous work. The meals, meeting the friends, and dissemination only add their extra forms to the inner search. All our work has to be focused on this one point. The Torah, “Leviticus” 2:13: And every meal-offering of thine shalt thou season with salt; neither shalt thou suffer the salt of the covenant of thy God to be lacking from thy meal-offering; with all thy offerings thou shalt offer salt. The Torah attaches very great importance to salt. Even in our world, we see how important it is; it is impossible to live without it. Salt is the world’s only natural preservative that keeps everything. People used to put salt on food products in order to preserve them. Today sugar is also added as a preservative to food, but this isn’t the natural method of preservation in which they used only salt. Salt preserves everything, so it is called a covenant of salt, the union of salt. Because salt was dear in the past, its price was its weight in gold. If I make a covenant with someone, such as the Creator, for example, by bringing Him bread as an offering, which means my corrected part, I have to bring bread with salt. This means that I have really corrected my desire. Spiritually this means that I have reached the end of correction of a certain desire, which means that I have corrected the whole ego that was revealed in me at a certain point as altruism. At the same time, I also calculate that this correction isn’t final, and this is symbolized by the salt. Question: According to Kabbalistic geography, does the Dead Sea symbolize Malchut? Answer: The Dead Sea (in Hebrew, the Sea of Salt) is the lowest point on earth. It has to be salty since salt is the lowest, most essential, non-deteriorating food substance. What do we consume in its natural form from nature? Water and salt. Water and salt are the material of the Dead Sea. Malchut is the embodiment of all the still nature , so there is actually no life in the Dead Sea except for some bacteria. But today the world is in a state that bacteria exist in different forms and we may certainly soon find out that they have also been discovered on Mars. But ordinary life cannot exist in salt because it is a preservative that fixes all the attributes. It doesn’t allow anything to develop. It is a pure attribute of Malchut. The water of the Dead Sea, which means the attribute of Bina, is intended only for the salt to grow and symbolizes the use of the slightest altruistic awakenings for the sake of the ego. Using the Creator for yourself, this is the addition of water to the salt.